For those intending to spend a longer holiday in the Dolomites, this tour is an ideal cycling introduction to the area. Most of the tour runs on the meticulously sign-posted Cortina–Dobbiaco cycle route, while the steep climb on technical terrain to the Forcella Lerosa requires a good amount of stamina. 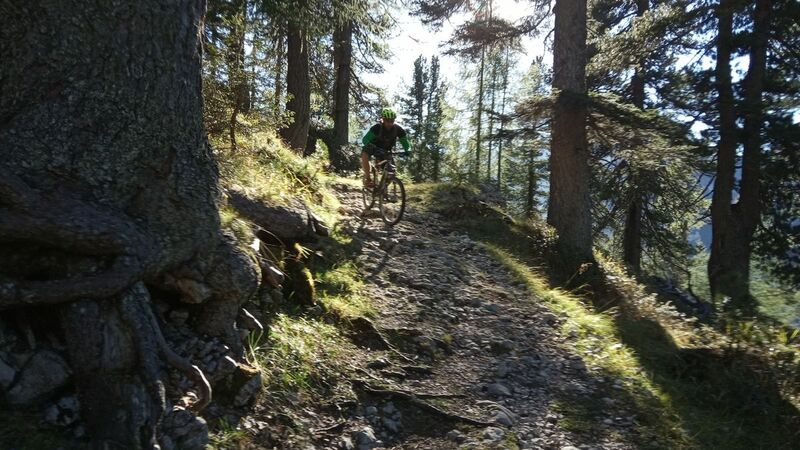 Reward is a nice single-track section with tight switchbacks from the Forcella to the Malga Ra Stua. Just the landscape is reason enough to get out on a bike. even the physical effort is contained with an 810 metres climb. this tour derives its name from the Forcella Lerosa, located on a high altitude alp at the beginning of the Val de Gotres. A little wooden cross commemorates an Austrian military cemetery from the Big War. the Forcella Lerosa is a popular passage for cyclists to get to Marebbe in Alto Adige, riding through the Val Salata and the Rifugio Sennes. From ➊ cortina bus station (1220 m) take the sign-posted bicycle path in the direction of Dobbiaco; 1 km before the Passo di cima Banche cross the ➋ SS 51 and follow directions to Val di Gotres, and then take MtB route n. 10 to the ➌ Forcella Lerosa (2020 m). continue to ➍ Monte de Lerosa (1995 m) and from here to the left start descending on switchbacks ➎ to the Malga Ra Stua (1668 m, food available). continue on paved road to arrive at the ➏ S. Uberto car park (1449 m), and then on ➐ the village of Felizòn (1005 m), eventually riding past the ➑ Fiàmes hotel. At the camping olympia get back onto the road, cross it, and return to the starting point along the bicycle path. Get the Bikemap app for your mobile to ride Tour at Forcella Lerosa, to track your own routes and to share them with an active online community of 1,000,000+ cycling enthusiasts.